Those who have been Mac users for a decade or two will remember all the auditory fun that could be had with alert sounds and the clock. 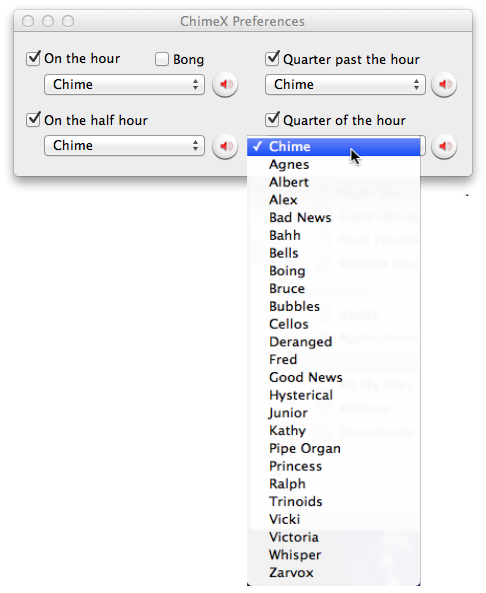 You could choose alert sounds to chime (play) on the quarter hours. It was very easy to customize the Mac with more alert sounds, and a company by the name of Clixsounds began providing all sorts of free sounds. This art reached its zenith with Westminster-style sets of sounds having melodies progressing through each quarter hour. Various tunes were used, with a seasonal favorite of mine playing “We Wish You A Merry Christmas.” Not only clock tower bells, but piano, glockenspiel, and other instruments were used in the sounds. Apple eventually provided the capability for announcing the time using any of the Mac’s built-in voices, and removed the capability of using alert sounds for the chimes. Voice announcement is trés cool, but what to do if one wants to hear the time without it joining in the conversation? Enter ChimeX, a modern version of an application that came out a decade ago, which plays clock chimes on the quarter hour. It is available from the Mac App Store. After starting, ChimeX appears as an icon in your menu bar (see Figure 1). Looking at its preferences, we see ChimeX allows individual selection of a sound to be played (or not) on each quarter hour (see Figure 2). There is also a Bong selection to ring the number of the hour. Studying the available sound choices, we see that ChimeX offers only one Chime selection. This is a Westminster-style clock bell sound, which progresses through each quarter hour, and is quite nice as far as it goes. The other selections are voices to speak the time, which are not a reason to purchase this application as you, gentle readers, know because that can already be done through the Date & Time System Preferences. ChimeX currently offers no way to add additional sounds. But, as readers of ResExcellence know, we won’t let that get in our way! Let us first see where ChimeX obtains its chime audio. In the Applications folder, where it is installed, control- or right-click on ChimeX, and select Show Package Contents (see Figure 3). Making our way to Contents->Resources, we discover that five .mp4 files are used for the quarter hour chimes, and the hour count toll (see Figure 4). So, in order to play a chime sound in ChimeX, we need .mp4 sound files. The original Clixsounds chime sounds were .snd files, which is the format that Mac OS System 7 used. I long ago converted my .snd files to .aiff files, the format used for OS X alerts, using the SystemSound Converter application. SystemSound Converter is part of the open source SystemSound project. The other part of this project, SystemSound Extension, plays a wide variety of sound file formats independently of iTunes. This is a story for another day. 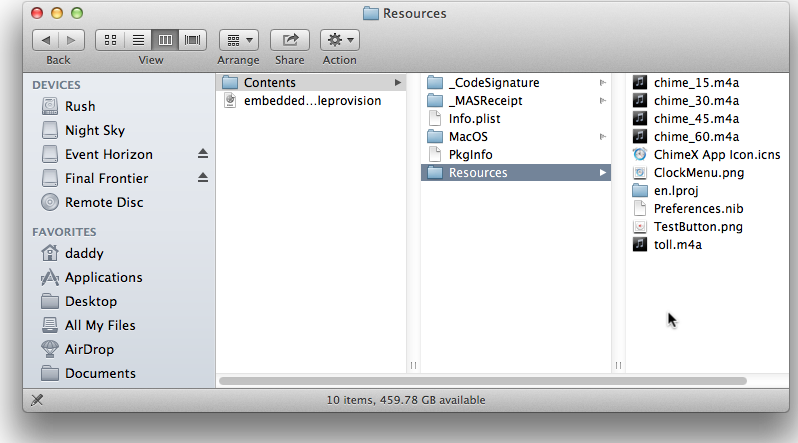 Since .aiff files are the format used for OS X alerts, you may already have a number of files in this format. You can easily convert these sound files to .mp4 format by using the free Music Converter application, available from the Mac App Store. 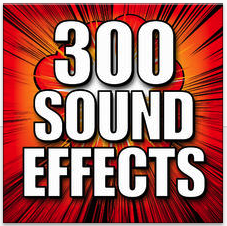 You can also purchase albums of sound effects through iTunes, which will already be in .mp4 format. Make copies of your sound files, and of the ChimeX application. Always work with copies rather than originals, gentle readers, to prevent inadvertent disasters! Rename your sound files to the same names as ChimeX expects: chime_15.m4a, chime_30.m4a, chime_45.m4a, chime_60.m4a. Also toll.m4a if you have an hour count sound. Open the Resources folder in the ChimeX application, following what we did above in Figures 3 and 4. Copy your renamed sound files into the ChimeX Resources folder, replacing the existing .mp4 files. Start your modified ChimeX application, and enjoy your custom chimes! Now that we’ve seen how to do this, it’s time for our first Reader’s Challenge. Let the musicians among us create Westminster-style .mp4 chime sound sets, recording themselves playing their tune of choice on their axe of choice. We’ll make the submitted chime sets available on ResExcellence.